Fender® Forums • View topic - Model Fender acoustic guitar? Post subject: Model Fender acoustic guitar? I recently came across this image of a Fender acoustic guitar and I've been trying to pinpoint the model ever since! It'a a little unusual as it doesn't seem to have any fret inlays except for Fender's "F" logo on the 12th fret. Is this a dreadnought? Concert? Maybe a smaller-sized version? Or maybe an older version of the C60? Post subject: Re: Model Fender acoustic guitar? To me it is not a Fender Guitar. Considering how long and in how many places Fender acoustics have been made, I won't doom the the guitar a fake based on one (blurry) pic only. Especially with that 12th fret logo - if it's a real inlay (not a sticker), I'd think a fakemaker would choose simpler procedures for faking. But on that one pic only, I won't call it legit either. The body shape seems almost Gibsonisque, although there is some resemblance to the Hellcat & old F-series. I'd estimate it to be about concert size - especially since the size class borders stretch a lot. If legit, it could be (something like) an F-series, lower price class guitar - and a special/limited/promotional run is quite possible. But: there seems to be a paper sticker in the soundhole. Serial number and model are usually on it. And there probably is the manufacturing country somewhere on the guitar. Did I see a sticker by the sound hole inside the body ? So I got a reply from the seller. 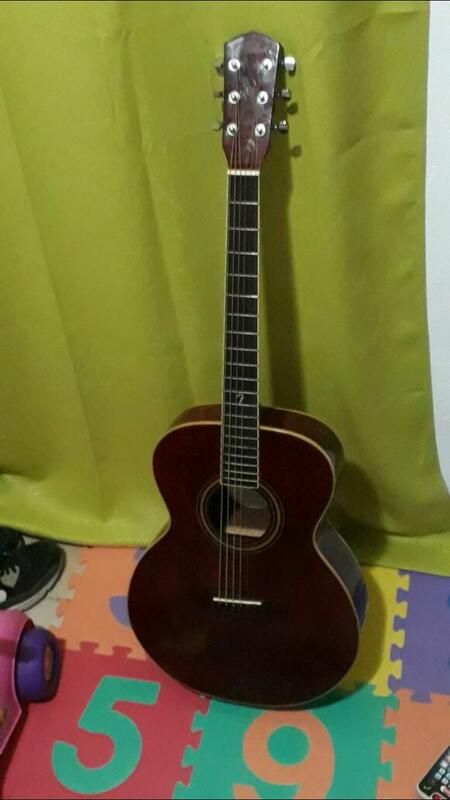 It's a GDO-200, an orchestra style acoustic with a quilted ash top. Not sure how much those are/were worth, but I'm not sure that size will be appropriate for the music I play (alt rock) and/or strumming. What do you guys think? On the compatibility to alt rock/strumming, Fender acoustics are mostly very general purpose tools. Sort of like a pencil; you can write any language with those little wonders - provided you have the abilities yourself. The original price was in the low section of Fender acoustics, so the price level now follows the original. To me, the 250$ st52 mentions seems a bit high. On the other hand, those are not very common, which may heave the prices upwards. Yep, but I was referring to the double meaning of the word.